Farm owners face a growing choice as tire technology has become more refined. Options vary for rear and front tractor tires and choices start with operational requirements like implement farm tires, traction drive tires and narrow row crop tires. Rear tractor tires are much larger than front tires to give the tractor its traction and pushing capabilities. When shopping for this type of tire you will want to look at things like radial construction vs. bias ply as well as tread design. The choice between a radial or conventional bias-ply farm tractor tire is a tough one. You may experience more sway with radials as your speed increases, but less bounce than is typical of bias ply. That point may affect handling characteristics and cultivation control. Radials put down a larger footprint than bias-ply. With more lugs on the ground the radial tires can ’bite in’ more on surfaces. The bigger footprint also stops the tires from sinking in as much, especially in turns. The downside of radial tires is that they are more expensive and have less tread options. Thomas Tire Commercial & Off-Road has been a choice of commercial fleets, both large and small for over 30 years. 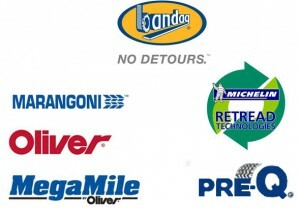 Our Commercial & Off-Road Tires division is always there for our customers. Whether it’s a simple flat repair or tires installed, we have after-hours emergency roadside assistance to help keep your downtime to a minimum. Other services offered include rim and wheel reconditioning, foam filling, tires for medium truck, OTR, forestry, industrial and farm from manufacturers like Goodyear, MICHELIN®, Bridgestone, Continental, Hankook and many more suppliers. Contact us today at 1-800-537-2042 for all of your commercial tire and service needs. By maintaining correct tire pressure optimum fuel economy and maximum retreadability can be achieved. This, combined with minimal wear and tear, reduce tire costs per mile to an absolute minimum. Poor inflation pressure can add up to serious cost increases over the life of tires and the heavy vehicles they are mounted on. In an industry where budgets are so critical, this needs effective management tactics to overcome unnecessary expenses. Underinflated tires run hotter. This can lead to reduced miles per tire casing and reduce retreadability, resulting in fewer re-saleable casings. One way of ensuring tires maintain the proper inflation is to fill them with nitrogen. Pure nitrogen has been used to inflate critical tire applications for years, primarily because it doesn’t support moisture or combustion. These include racing tires (IndyCar, Formula 1, NASCAR), aircraft tires (commercial and military) and heavy-duty equipment tires (earthmovers and mining equipment). When drive tires begin to wear, it is a good idea to rotate them. Changing the rotation of drive axle tires will usually help to smooth them back out, providing better tread life and fuel efficiency. You can send the tires to our retread shop or for the tires that still have tread remaining, move them back to trailer positions. Some transport companies move drive tires to the trailer to increase the miles they get from each casing. By reducing costs and increasing miles per tire, you will get the most from your commercial truck tires. Maintaining proper inflation and good driving skills, together with a tire inspection and maintenance program rather than driving until breakdown, will maximize the efficiency and profitability of your vehicles. Thomas Commercial & Off-Road Tires ensures a proper balance every time by employing the latest balancing technologies and products. In addition, our expert staff is trained to use these methods to deliver timely and accurate service. Thomas Commercial & Off-Road Tires only uses the finest computer wheel balancers from Hunter to ensure a smooth ride and excellent performance. Out-of-balance tires will cause a vehicle to vibrate at certain speeds, usually between 50 and 70 miles per hour. A tire is out of balance when one section of the tire is heavier than the others. One ounce of imbalance on a front tire is enough to cause a noticeable vibration in the steering wheel at about 60 miles per hour. Our customers are often pleasantly surprised at how smooth their vehicle drives after balancing the wheels. Proper tire and wheel assembly balancing is important from a vehicle safety standpoint. In high-speed driving, improperly balanced tire/wheel assemblies will cause a vehicle to lose stability and not operate in a safe and comfortable manner. Improperly balanced assemblies also cause abnormal treadwear patterns. Match mounting tires on wheels is a process where a tire’s installed position on the wheel is specifically selected to help minimize the final combination’s force variation and/or imbalance. One match mounting procedure aligns the tire’s measured high point of radial force variation with the measured low point of the wheel’s radial runout. The other simply aligns the tire’s lightest spot with the wheel’s heaviest spot. Thomas Commercial & Off-Road Tires provides wheel refurbishing services with state of the art equipment and an expert staff. Your rims and wheels can be refurbished with a quick turnaround time. The high gloss, powder coat paint used will resist chipping, peeling and rusting. By efficiently removing old coating and creating less etching, you’ll have less inventory, less labor and less maintenance needs. It also means rims can be in-service longer which further enhances your ability to provide superior service. Thomas Commercial & Off-Road Tires offers standardized, quality truck and trailer inspections which help you avoid costs on DOT fines and emergency services. Thomas is committed to improving vehicle safety and improving fleet efficiency by optimizing time and increasing driver satisfaction with better-maintained equipment. The number one and number two operating expenses in over-the-road transportation are fuel and tires, respectively. Both are typically perceived as hard to control. Routine wheel alignments, however, are the most effective way to control tire costs and can impact fuel costs as well. A miss-aligned trailer could be costing you and extra 500-700 gallons of diesel fuel per year per trailer. A tractor trailer alignment can save you up to .25 miles per gallon. You can raise your mpg from 6 to 6.25 just by re-aligning a trailer that is out of alignment. We recommend a minimum of two alignments per year or every 50,000 to 60,000 miles as part of the average vehicle’s preventive maintenance program. Thomas Commercial & Off-Road Tires offers a wide range of mechanical repair services for your commercial vehicles. These include PM Services (oil change, safety check), State and Federal Inspections, Steering, Suspension, Radiator Repair, Brakes (Air and Hydraulic) and all major and minor repairs (excluding body work). Industrial tires require strength, the ability to absorb shocks, and resist cuts and abrasions. In addition to different sizes for different industrial applications, tires offered by Thomas Tire Commercial & Off-Road have different fillings: air-filled, foam-filled and solid rubber tires. We carry tires for all applications. Commercial truck tires are an integral part of a business, a part that will decide profit margins and perhaps contracts. For the commercial truck driver, so much needs to be taken into consideration. Poor inflation can reduce fuel economy and retreadability. Tire wear is consequently increased. These simple things can increase the cost per mile and make all the difference between profit and loss. At Thomas Commercial & Off-Road Tires we are dedicated to ensuring that your commercial tires stay “true” for the life of the tire. Air-Filled (Pneumatic) Tires: This type of tire is very similar to those used on heavy-duty trucks; they are air-filled and made of very strong rubber for extra durability. If you are looking for a tire with deep tread that will receive its fair share of wear and tear, then pneumatics is the choice. A pneumatic tire will also extend the life of your machinery. The tires provide superior cushioning, so if you’re expecting your equipment or vehicle to be used in a wide range of environments this is the choice. The downside is pneumatic tires will go flat. Foam-Filled Tires: Flat tires can be very expensive: lost time, lost revenue and equipment replacement can bring your operation to a grinding halt. But with a foam-filled tire you’ll never have to worry about a flat again. Tires are filled with a resilient liquid compound that cures to a soft rubber core within 24 hours. Foam filled tires are more cost effective in multi-hazard areas where flats are frequent. Foam-filled tires can also give better traction and make your vehicle more stable. The process for foam filling requires a quality tire – not old or dry rotted. It is left with us to be filled, where it is kept in a controlled environment to cure. Most are ready to be picked up the next day.From construction vehicles to mining and industrial equipment, foam filling is the right choice for anyone who is tired of the cost, delays and inconvenience of flat tires. Solid Rubber Tires: If your equipment will be used mainly indoors, a solid rubber tire is a good alternative. They are similar to pneumatic tires but are not inflated with air. They are as the name states, solid rubber. In fact, solid rubber tires once were the only tires available. The big advantage with solid rubber tires is that you do not have the usual problems associated with pneumatic tire failure. Punctures, blow-outs or tire popping is a thing of the past with solid rubber. However, they are significantly less comfortable for the operator and cause more wear and tear on the machine. Outdoor use should be limited because of the rougher ride. Improper handling, poor maintenance and improper driving habits can harm these costly tires and consequently raise the operating cost of running your equipment. When contacting us about your OTR tires, have your size available and what conditions you will be operating your machine in. With so many tires being manufactured for specific industries, to get the most out of your tire, use one most suitable for the job. If you are not sure, ask! Our tires are stocked in several locations and are ready to ship to most anywhere. We work with several trucking and container companies to easily ship 1 tire or a full container, quickly and efficiently. Whether you are under a deadline, in the middle of a job or just can’t schedule a time to make it into our service center it’s never a problem for the Thomas Commercial & Off-Road Tires division. We have multiple service trucks ready and waiting to install our tires on location for your convenience. Call us today at 1-800-537-2042 to schedule an appointment! Subscribe to our deals and newsletter!